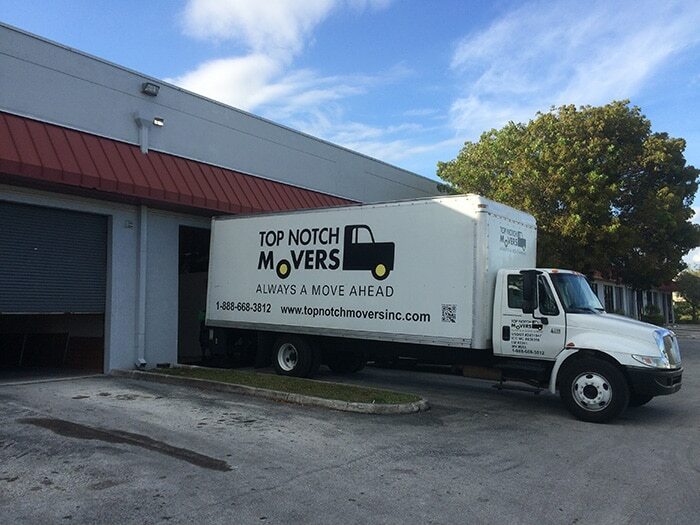 Top Notch Movers Inc. provides full-service Fort Lauderdale move to storage facilities. Each storage unit, which is secure & clean, provides protection for your valuable household belongings. A specified inventory list is provided to you and lists each item being moved from your home into the storage facility. We use individual stickers to further identify each item being moved. A sticker containing a serial number with a corresponding color will be placed on each article. This ensures your easy identification and retrieval of all your personal items. We Protect all mattresses, sofas, and cushioned furniture with new, clean, and clear plastic covers. All other items such a metallic, wood, or plastic furniture is protected with our professional moving blankets. All items moved into our storage units are kept protected in their respective units using the materials used in initial packing. There is no added monthly charge for use of our padded moving blankets. Moving all your goods to a storage in Fort Lauderdale can be very stressful. You want to make sure that your furniture and all your packed items will be taken care of and that nothing will get damaged or break. Our professional team and move to storage facilities will take care of that. Our Fort Lauderdale move to storage service is the best storage service for your personal goods. We will take care of all your furniture and packed items for as long as you need. Once you are ready to accept your belongings in your new place, we will deliver everything to your home. We will go over the inventory list with you to make sure nothing is missing or damaged. Every item will be taken to its rightful place at your home and in case there is a need to reassemble anything, we will gladly do that too. Top Notch Movers is a professional and experienced moving company, and we have your back. As Fort Lauderdale move to storage professionals, we love offering our clients exceptional customer service that is unparalleled by other moving companies. Our ultimate goal is customer satisfaction and if you are not satisfied, neither are we. Call us today for a free estimate and quote! First part of the move went super smooth with top notch movers. Both paul and eddie were extremely efficent and professional. Made moving out a breeze. Looking forward to getting through the second part of the move with the same ease.